Many of my patients are dealing with a lot of stress, and they often ask me what they can do to reduce their stress and not feel so overwhelmed. You don’t need fancy equipment. You don’t have to be religious. No matter your background, you can enjoy the practice and reap the benefits. It’s a great way to “quiet” your mind and focus on what is truly important in your life. I like to think of it as a workout for your soul. 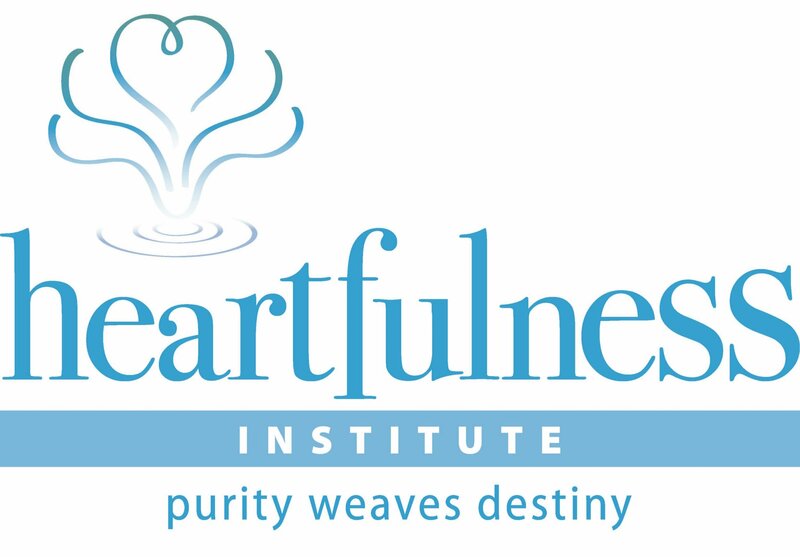 One of my favorite meditation practices is called heartfulness meditation, and it’s a life-changer. It’s a relaxation technique that will bring you calm, focus and the ability to live in the moment. 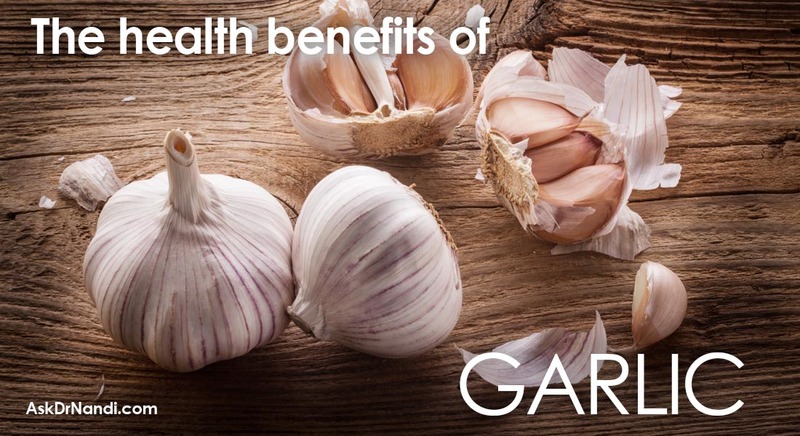 There are so many health benefits, and you can use it to achieve purpose in your life. It’s a simple approach to connect with your heart … and all matters of the heart. It’s such a beautiful way to connect with what matters. 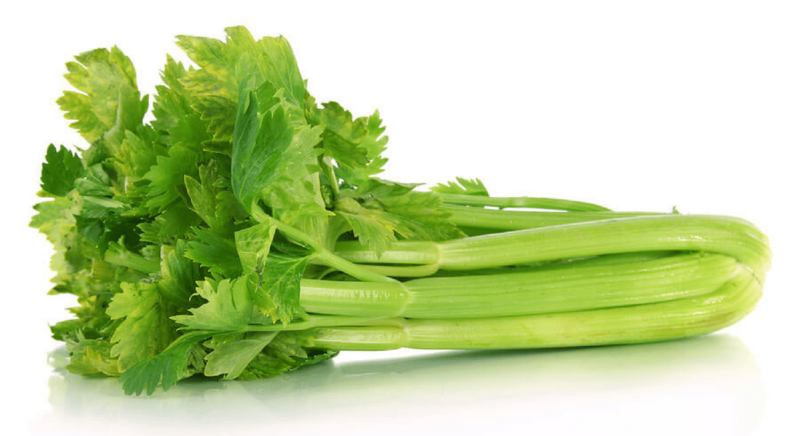 It’ll reduce your anxiety, lower your blood pressure and help cultivate strength and serenity. If you’re looking for an easy way to keep your stress down and feel more in control, you’ll love it. Where mindfulness raises your awareness of the present moment, heartfulness brings your focus inward to your heart. Balance, guidance, love, purpose and serenity come to light. This practice transcends cultural and religious barriers and brings together people from all around the world. 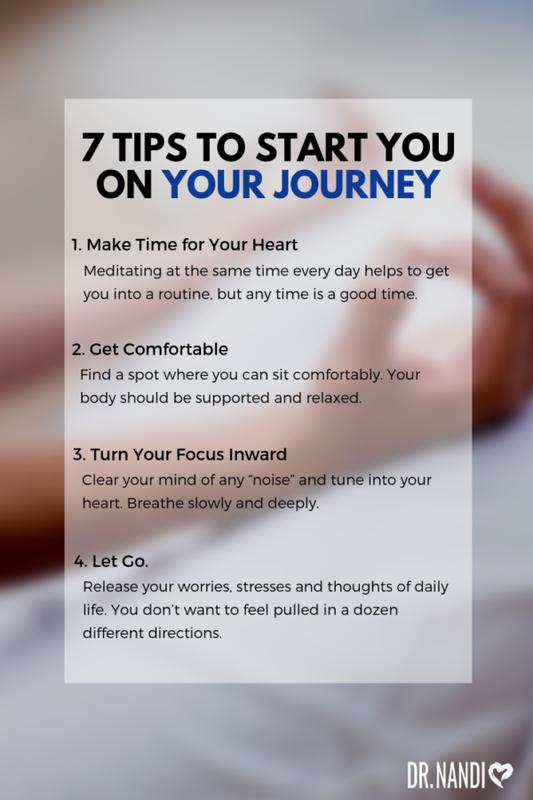 5 tips to start you on your journey. Make time for your heart. Even 15 minutes each day is enough to make a difference. Meditating at the same time every day helps get you into a routine, but any time is a good time. Get comfortable. Find a spot where you can sit comfortably. Your body should be supported and relaxed. Turn your focus inward. Clear your mind of any “noise” and tune into your heart. Breathe slowly and deeply. Let go. Release your worries, stresses and thoughts of daily life. You don’t want to feel pulled in a dozen different directions. With each breath in, take in calm, peace and lightness. With each breath out, let go of worldly things that distract your focus. Begin to notice the energy and vibration expanding within you. Continue to tune into your heart and let whatever naturally comes from within you rise to the surface. If your mind wanders, simply return to your heart. Take time to reflect. When you’ve completed your meditation, think about your experience. How do you feel? What thoughts came to the surface? What did you learn about yourself? You’ll likely come back to the experience again and again throughout your day. Bonus Tip: If music helps you to focus and feel calmer, you can play something quietly in the background. Singer, songwriter and musician Moby (any Moby fans here?) recently released 4 hours worth of free music designed for yoga and meditation! Cultivating a sense of spirituality – simply a belief that you are connected to something greater than yourself – is one of the best ways to achieve a healthier life. Take time each day for pause and reflection. It’s a beautiful way to connect with what matters while improving your health and honoring your heart. Identify your stress triggers. Then, implement strategies for dealing with them like scheduling breaks throughout your day, going for a walk or making time to reflect. Make stress-reduction part of your daily routine. Take time every day for some heartfulness meditation, yoga, tai chi or deep-breathing exercises. Laugh. A good belly laugh lightens your mental load, lowers stress-causing cortisol and increases mood-boosting endorphins. Lean on your tribe. Talk to your loved ones and vent when you’re feeling overwhelmed. This act of sharing can help reduce your stress and anxiety and give others the opportunity to support you. Thank you, thank you! I’m a caregiver. I help support my 2 disabled brothers with schizophrenia. My mom a victim of domestic violence who suffers with brain injury. My divorced daughter with her 4 children. My son, driving him 70 miles a day because of a DUI. My bipolar sister needs minimal support. Payee for youngest bipolar brother. My 2nd youngest brother has heart disease. Aging father 700 miles away. Depressed husband whom I’m separated from but in contact with. I’m living a nightmare. This article has given me hope to help me find time for me so that I can manage my stress. I just broke down in tears when I saw it. Hi Shirley, and thank you for sharing! I’m happy to hear that what I shared about heartfulness meditation has had an effect on you. Self-care is crucial to maintaining your health and energy. If you’re willing, please consider sharing your experience once you’ve given it a try. This is going to be so helpful, Dr. Nandi. Thank you sooo much. I lost a friend yesterday of 30+ years…nothing makes sense today. This came just in time! Hi, Mirie. I’m so sorry to hear of your loss. Losing someone is never easy. Now more than ever, I hope that you’ll lean on your tribe and welcome their support and encouragement. You also have our Health Hero community to lean on! Great, Ruth! Will you stop back and let us know what your experience was like? Thank you, Dr. Nandi. I will try it. I honor God by the words I speak, I honor Him by the way I act. Allowing His love and light, to shine through me. So yes, I can honor my heart by rendering 15 minutes of all of the above! You’re welcome, Princella! I’m so glad to see that you’re choosing to prioritize your well-being and devote some time each day to honoring your heart and health. Sounds like a Health Hero to me! Excellent, Dr. Nandi. Meditation is as important as breathing. Thank you for sharing this article. Thank you, Nikhil! You’re right. 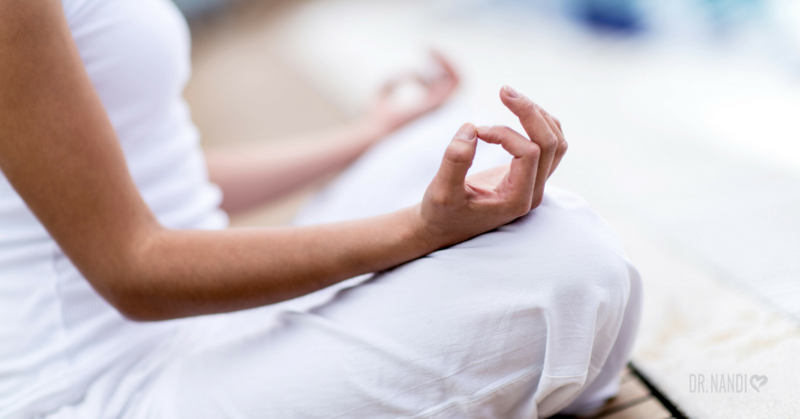 Meditation, reflection and spirituality are key factors in living a Health Hero lifestyle. Thank you for sharing with us! I think the key is to allocate some time each day consistently until it becomes a habit. My first step will be to start with 5 minute sessions and see if I can increase the them gradually. You nailed it, Libby! Taking small, realistic steps each day is what I recommend. Lifestyle changes do not have to be overwhelming. Your plan is ideal and will likely set you up for long-term transformation. Way to be a Health Hero!